If a patient who was in immunodepression status develops severe back pain, the clinician should be suspicious of the possibility of spondylitis by P. micros and start antibiotic therapy after undergoing sample collection. 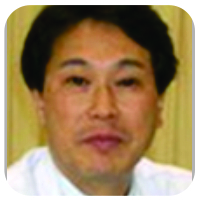 Department of Orthopaedic Surgery, Sapporo Medical University School of Medicine, S1 W16, Sapporo, Hokkaido, 060-8543, Japan. Case Report: A 73-year-old man with a history of diabetes mellitus was admitted to our hospital with a 5-month history of severe low back pain. A radiograph of the lumbar spine demonstrated intervertebral disc space narrowing with indistinct end plates at the L3-L4 level. T2-weighted magnetic resonance image showed high signal intensity at L3-L4 intervertebral disc space. We suspected pyogenic spondylitis and performed percutaneous posterolateral endoscopic debridement. The results of intraoperative sample cultures were positive for P. micros, an anaerobic Gram-positive coccus. He was treated by the antibiotic therapy. 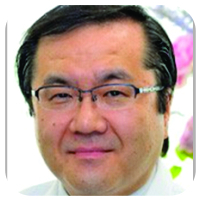 Low back pain resolved and his white blood cell count and C-reactive protein levels remained normal with the combination therapy. During 2-year follow-up, he reported no low back pain and had no signs of infection recurrence. Conclusion: If a patient who was in immunodepression status develops severe back pain, the clinician should be suspicious of the possibility of spondylitis by P. micros and start antibiotic therapy after undergoing sample collection. Keywords: Vertebral osteomyelitis, Peptostreptococcus micros, endoscopic debridement, anaerobic Gram-positive cocci. Anaerobic vertebral osteomyelitis has been reported rarely. Peptostreptococcus micros is one kind of anaerobic Gram-positive cocci and normally encountered in the oral cavity and respiratory, gastrointestinal, and female genitourinary tracts [1, 2, 3]. 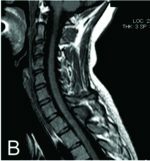 In this report, we describe an extremely rare case of a patient who suffered from vertebral osteomyelitis caused by P. micros. A 73-year-old man with a history of diabetes mellitus was admitted to our hospital with a 5-month history of severe low back pain. On admission, he had no fever, and neurological evaluation was within normal limits. A lateral radiograph of the lumbar spine demonstrated intervertebral disc space narrowing with indistinct end plates at the L3-L4 level. A computed tomography (CT) scan revealed destruction of the posterior wall and sclerotic changes of the vertebral body at L3 and L4 (Fig. 1). 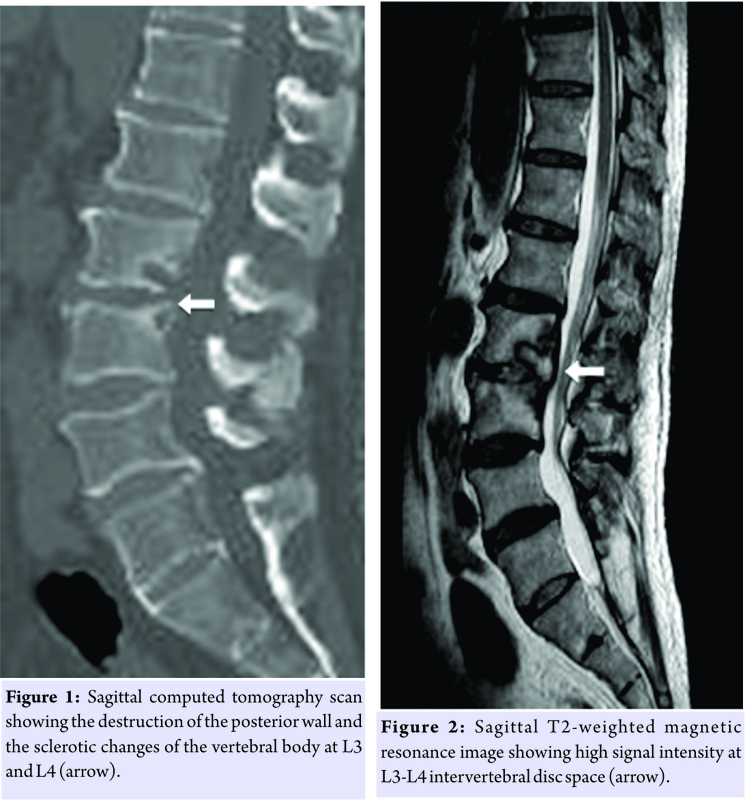 T2-weighted magnetic resonance imaging (MRI) showed a high signal intensity area at the L3-L4 intervertebral disc (Fig. 2). His white blood cell count was 8400/µL, and C-reactive protein level was 2.37 mg/dL. Initially, we suspected pyogenic spondylitis and encouraged him to rest with a lumbosacral corset. Percutaneous posterolateral endoscopic debridement and irrigation of the intervertebral disc according to Ito’s procedure  were performed 6 days after admission. Surgery was performed with the patient in the prone position, using the Yeung endoscopic spinal system (Richard Wolf Medical Instruments, Vernon Hills, IL, USA). A micro endoscope was obliquely inserted at 45° to the vertical line, targeting the center of the disc space. Aggressive debridement of the infected disc material and saline irrigation was performed. A 3-mm diameter drain tube was placed in the disc space, and drainage continued for 7 days after the surgery. After the surgery, he received antibiotics starting with 1 g cefazolin empirically administered intravenously 3 times daily for 10 days. Blood and urine samples remained sterile. Although gradual improvement was seen in the inflammatory response, his low back pain continued. Intraoperative sample culture results tested with the Rap ANA II SYSTEM (Norcross, GA, USA) and were positive for P. micros, which is sensitive to piperacillin. Therefore, we changed the antibiotics to 1 g piperacillin intravenously 3 times daily for the next 35 days. After that, he developed a rash all over his body. We suspected drug eruption and changed the antibiotics to 600 mg clindamycin intravenously twice daily for the next 12 days. 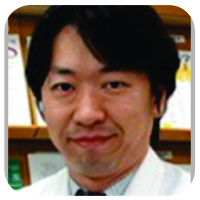 Because his low back pain gradually subsided and inflammatory response became negative 8 weeks after the surgery, we prescribed 200 mg oral minocycline daily for 7 months. 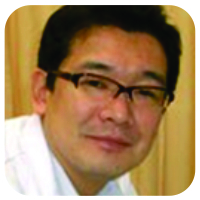 He was discharged 2 months after the surgery. 8 months after initiation of treatment, radiographs and CT scans of his lumbar spine showed sclerotic endplate changes, and T2-weighted MRI revealed restored signal intensity at the L3-L4 intervertebral disc. He reported no low back pain and had no signs of infection recurrence. Pyogenic spondylodiscitis is usually caused by aerobic organisms, and vertebral osteomyelitis due to anaerobic bacteria is extremely rare. Han et al. reported that anaerobic vertebral osteomyelitis appeared to account for <3% of all spondylodiscitis cases. Some authors [5, 6] reported that the most frequent organisms responsible for anaerobic spondylodiscitis were Bacteroides species, Propionibacterium acnes, and Peptococcus species. Vertebral osteomyelitis caused by Peptostreptococcus species, which is a type of anaerobic Gram-positive cocci, is exceedingly uncommon. To the best of our knowledge, only four cases of spondylodiscitis due to Peptostreptococcus species have been reported. Because most P. micros are found in the oral cavity, the intestines, and the female genitourinary tract, bone infections caused by P. micros generally occur after dental and sinus infections or pelvic infections in women [7, 8, 9, 10]. 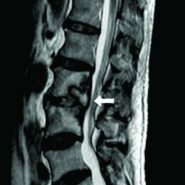 Immunocompromised status or past operations may also be risk factors for anaerobic vertebral osteomyelitis. In this case, the patient had no oral infections or past operations, but he had diabetes mellitus. The main symptoms associated with anaerobic vertebral osteomyelitis are back pain, fever, and motor neurologic deficits, which are similar to the symptoms of aerobic vertebral infections . In addition, radiograph and MRI findings of anaerobic spondylodiscitis are also similar to aerobic spondylodiscitis [4, 6]. Therefore, distinguishing anaerobic spondylodiscitis from aerobic vertebral infections by symptoms and images alone may be difficult. In fact, as Saeed et al. pointed out, we have not been able to identify any features typically found in patients with infection due to P. micros. One of the reasons vertebral osteomyelitis caused by P. micros is rarely diagnosed may be the difficulty of specimen isolation. Positive blood cultures are uncommon, accounting for only 24–62% of cases of anaerobic spondylodiscitis . Brook  reported that isolating Peptostreptococcus required appropriate methods of sample collection, transportation, and cultivation. However, although anaerobic culture techniques have improved recently, culture-proven anaerobic vertebral osteomyelitis remains rare, perhaps, because of widespread antibiotic administration before taking biopsy specimens. In fact, in all four culture-proven cases of vertebral osteomyelitis due to Peptostreptococcus species, biopsies were performed before administrating antibiotics. Therefore, early intervertebral disc biopsy with the appropriate culture technique should be considered to identify the causative agent before empiric administration of antibiotics. In general, anaerobic organisms have relatively low virulence and are sensitive to some types of antibiotics such as clindamycin, penicillin G, ceftriaxone, and metronidazole. Among others, clindamycin is now recommended because of having good bioavailability against Gram-positive anaerobes such as P. micros. Zimmerli  suggested that the first choice of treatment for anaerobic vertebral osteomyelitis should be 300–600 mg of clindamycin administered intravenously every 6–8 h. In past reports, in fact, all patients affected with anaerobic vertebral osteomyelitis caused by P. micros received antibiotics including clindamycin and recovered or improved. We report a rare case of vertebral osteomyelitis caused by P. micros. If a patient who was in immunodepression status develops severe back pain, the clinician should be suspicious of the possibility of spondylitis by P. micros and start antibiotic therapy after undergoing sample collection. 1. Papasian CJ, McGregor DH, Hodges GR, Kennedy J. Peptostreptococcal vertebral osteomyelitis. J Clin Microbiol 1986;24:633-5. 2. Riesbeck K, Sanzén L. Destructive knee joint infection caused by Peptostreptococcus micros: Importance of early microbiological diagnosis. J Clin Microbiol 1999;37:2737-9. 3. van Dalen PJ, van Steenbergen TJ, Cowan MM, Busscher HJ, de Graaff J. Description of two morphotypes of Peptostreptococcus micros. Int J Syst Bacteriol 1993;43:787-93. 4. Ito M, Abumi K, Kotani Y, Kadoya K, Minami A. Clinical outcome of posterolateral endoscopic surgery for pyogenic spondylodiscitis: Results of 15 patients with serious comorbid conditions. Spine (Phila Pa 1976) 2007;32:200-6. 5. Han IH, Choi BK, Nam KH, Kim SY. Bacteroides fragilis vertebral osteomyelitis complicated by percutaneous epidural adhesiolysis. Spine (Phila Pa 1976) 2013;38:E431-5. 6. Saeed MU, Mariani P, Martin C, Smego RA Jr., Potti A, Tight R, et al. 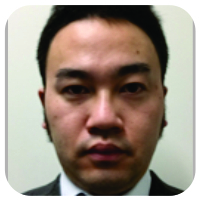 Anaerobic spondylodiscitis: Case series and systematic review. South Med J 2005;98:144-8. 7. Stoll T, Stucki G, Brühlmann P, Vogt M, Gschwend N, Michel BA, et al. 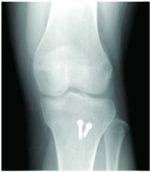 Infection of a total knee joint prosthesis by Peptostreptococcus micros and Propionibacterium acnes in an elderly RA patient: Implant salvage with longterm antibiotics and needle aspiration/irrigation. Clin Rheumatol 1996;15:399-402. 8. Feng J, Austin TW. Anaerobic vertebral osteomyelitis. CMAJ 1991;145:132-3. 9. Brook I, Frazier EH. Anaerobic osteomyelitis and arthritis in a military hospital: A 10-year experience. Am J Med 1993;94:21-8. 10. Rousseau MC, Harlé JR. Spondylitis caused by Peptostreptococcus. Clin Rheumatol 1998;17:538-9. 11. Brook I, Cunha BA. Peptostreptococcus Infection. Medscape Reference 2014;http://emedicine.medscape.com/article/225140-overview. 12. Zimmerli W. Clinical practice. Vertebral osteomyelitis. N Engl J Med 2010;362:1022-9. How to Cite This Article: Shimizu J, Yoshimoto M, Takebayashi T, Terashima Y, Yamashita T. A Case Report of Vertebral Osteomyelitis Caused by Peptostreptococcus micros. 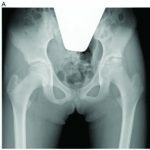 Journal of Orthopaedic Case Reports 2018. May- June; 8(3): 7-9.